4 humidifier filters compatible with Holmes HWF62 and HWF62CS. If you are ever unsatisfied with the performance of your humidifier filters, we'll refund your payment! Disclaimer: This is not a Holmes or Sunbeam OEM product. The Holmes and Sunbeam brand names and logos are the registered trademarks of their respective owners. Any use of the Holmes and Sunbeam brand names or model designations for this product are made solely for purposes of demonstrating compatibility. Packaging may vary, performance does not. 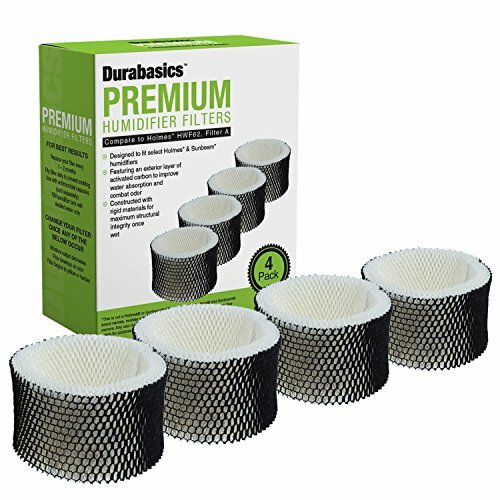 If you have any questions about this product by Durabasics, contact us by completing and submitting the form below. If you are looking for a specif part number, please include it with your message. Think Crucial Replacement for Aircare 1043 Paper Wick Humidifier Filter Fits Spacesaver 800, 8000 Series Console, 10.8" x 4.2" x 12.5"